This Federal style house, built in 1786, has undergone little alteration and is one the finest houses from this period in Vermont. 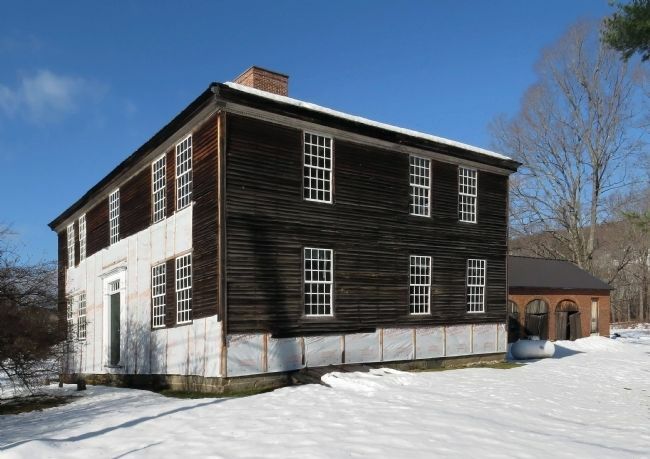 It was built by William Burtch, whose father came to Hartford, VT, from Stonington, CT about 1766. Burtch eventually owned some 500 acres. The brick ell, constructed circa 1830 for James Udall, was originally 2-stories; a lightning strike in 1936 burned most of the second story. 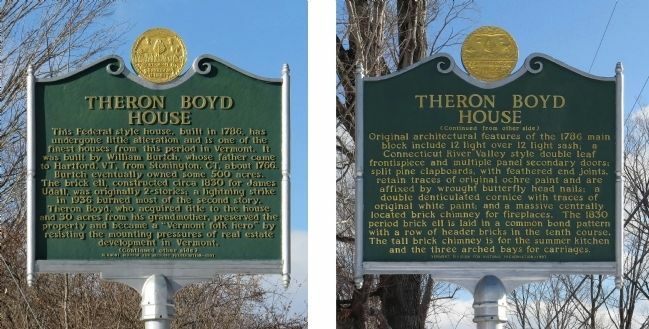 Theron Boyd, who acquired title to the house and 30 acres from his grandmother, preserved the property and become a “Vermont folk hero” by resisting the mounting pressures of real estate development in Vermont. brick ell is laid in a common bond pattern with a row of header bricks in the tenth course. The tall brick chimney is for the summer kitchen and the three arched bays for carriages. Erected 1997 by Vermont Division of Historic Preservation. Location. 43° 39.128′ N, 72° 26.755′ W. Marker is near White River Junction, Vermont, in Windsor County. Marker is on Hillside Road (Local Highway 6) west of Quechee Main Street, on the right when traveling west. Touch for map. Marker is at or near this postal address: 75 Hillside Road, White River Junction VT 05001, United States of America. Touch for directions. Other nearby markers. At least 8 other markers are within 5 miles of this marker, measured as the crow flies. Taftsville Covered Bridge (approx. 1.9 miles away); Disastrous Train Wreck (approx. 3.3 miles away); Woodstock Civil War Memorial (approx. 3.9 miles away); Justin Morgan (approx. 3.9 miles away); Woodstock (approx. 4.2 miles away); Marianne Gaillard Faulkner (approx. 4½ miles away); Hiram Powers (approx. 4.7 miles away); Site of First Ski Tow in the United States (approx. 4.8 miles away). 1. Theron Boyd | Historic Sites. 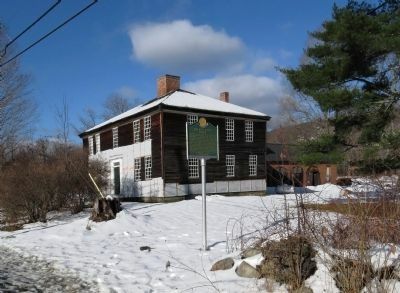 The Burtch-Udall Homestead (the Theron Boyd House) is a unique historic site that will provide insight into 200 years of Vermont life when it is formally opened to the public. More. Search the internet for Theron Boyd House. Credits. This page was last revised on June 16, 2016. This page originally submitted on December 29, 2014, by PaulwC3 of Northern, Virginia. This page has been viewed 320 times since then and 9 times this year. Photos: 1. submitted on December 29, 2014, by PaulwC3 of Northern, Virginia. 2, 3. submitted on December 30, 2014, by PaulwC3 of Northern, Virginia.